low salt recipes, low sodium recipes, recipes to reduce blood pressure. We all regularly use the words ‘blood pressure’ when we feel even slightly ill, without really understanding what they mean. Blood pressure (B.P) is merely the pressure exerted on blood vessels by circulating blood due to the rhythmic beating (contraction and relaxation) of the heart. That means normal blood pressure is not something to be worried about – if your heart is beating your blood will exert pressure on the blood vessels. What is a cause for worry is when a person has high blood pressure (or hypertension). In such a case his heart has to exert more force to pump almost the same quantity of blood within the same time. The two parameters for this are Systolic B.P, which is the pressure exerted during the contraction of the heart, and is always high; and Diastolic B.P, which is the pressure exerted during the relaxation of the heart, and is comparatively low. High blood pressure in an adult is defined as blood pressure equal to or greater than 140 mm Hg systolic pressure or equal to or greater than 90 mm Hg diastolic pressure. High blood pressure or hypertension is more and more prevalent these days, especially among younger people. Apart from stress and obesity, one of the reasons for this is excessive sodium and salt intake. Most people find it difficult to limit the amount of salt in their cooking, thinking it will affect the taste of their favourite dishes. Bajra and Jowar are rich in Potassium. Potassium is critical for those with High Blood Pressure as it lessens the impact of sodium. Eating more Potassium Rich Foods will remove more sodium from your body through urine. So include the basic bajra roti and jowar roti in your daily diet to have with Lower Blood Pressure Subzis Recipes. Kerala's famous vegetable, mixed vegetable thoran is a good low salt subzi to control blood pressure. There is 15% of Potassium daily requirement in one cup of cooked Rajma. Potassium is critical for those with High Blood Pressure as it lessens the impact of sodium. Have the rajma and bean sprouts salad that is an ideal Lower Blood Pressure Salads Recipe. Read here for the top foods that lower blood pressure and include them in your diet. The low blood pressure recipes in this section have been designed to use minimum salt yet retaining its taste and flavour. In most of the recipes we have measured and used the minimum amount of salt required to make a dish appetizing, however you can decrease or increase the salt according to the daily sodium limit prescribed to you. However in other recipes, you can follow a thumb rule – 1/8 to ¼ teaspoon of salt for a serving of 4. When salt to taste is mentioned in the recipe, then follow the above guideline of salt usage. Ranging from breakfast options,soups and Salads to rotis, subzis and international cuisine, the recipes use low-sodium ingredients, limited amount of oil and are devoid of high-sodium processed foods. Cabbage and Dal Paratha , Dahi Bhindi , Jowar Pyaz ki Roti , Mili Jhuli Subzi and many more recipes are a true treasure for hypertensives. For those who want to please their palate for pickle, can try Carrot Pickle and Green Chilli Pickle . So tuck the salt out of sight, and start reducing your sodium intake. Eat healthy to keep your blood pressure in check. The easiest and most reliable way to find out if you have high blood pressure is to have your B.P checked regularly. Blood pressure is measured in millimetres of mercury (mm Hg). The average ideal B.P levels are 120/80 for young people, and 140/90 for older people. Levels equal to or higher than these indicate that you may be suffering from mild, moderate or severe B.P. It is very important to initiate the right treatment once you discover what level of high B.P you suffer from. diet modification and proper medication. Once a person’s B.P reaches this level, it is very difficult to bring it back to normal. A person with such high B.P must be very cautious about medications, and maintain the right sodium and potassium ratio in his diet. Lifestyle modifications are also required. 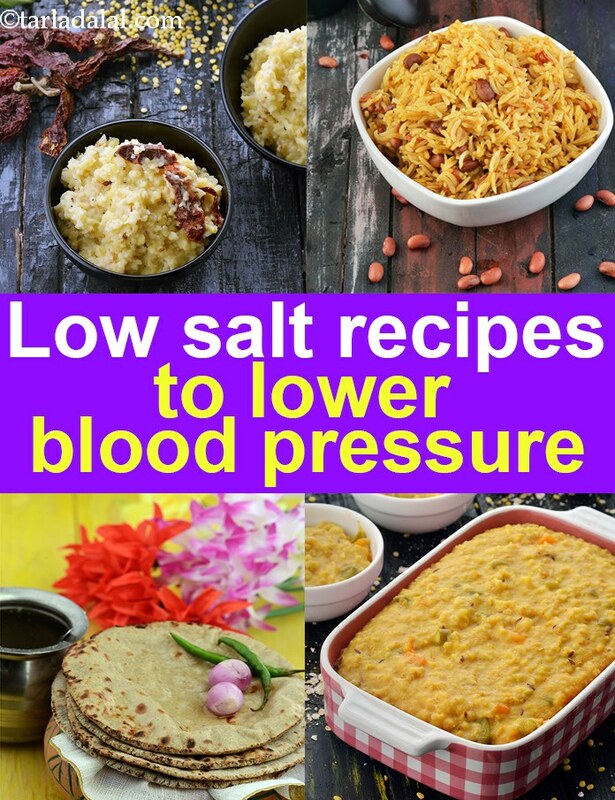 Enjoy our low salt recipes, low sodium recipes, recipes to reduce blood pressure and other low blood pressure articles below. Lemon grass imparts a subtly sweet flavour to this thai-inspired potassium rich mushroom rice. Tarla Dalal We don''t have a section on recipes for low BP. We are considering your request and soon will have recipes for this category too.